Penge welterweight Bradley ‘Super’ Skeete forms part of a richly gifted quartet of Brits presently nestled in the 147lb world rankings with the major sanctioning bodies writes Glynn Evans. Currently custodian of the WBO European title, the 27 year old south Londoner has bountiful options at both domestic and international title level. Ahead of his title defence against Italy’s one-time WBA ‘interim’ title challenger Brunet Zamora at Wembley on Saturday, the 6ft 1in Al Smith coached Skeete cast a critical eye over the leading domestic adversaries who could shape his future. 1. Amir Khan (ex IBF/WBA light-welter champion): “For me, Amir is still Britain’s best welterweight, above Kell Brook. Khan’s produced more on the world scene. He’s always in exciting fights and he’s got wicked hand speed, footwork and reactions. 3. Frankie Gavin (ex British and Commonwealth champion): “A man I know very well after sharing 12 rounds with him last November. Beforehand, everyone said I wasn’t in his league but I took him to the wire and landed the cleaner shots. I’m not bitter that I didn’t get the decision and I wish Frankie all the best in his world title fight with Kell but I can’t see him winning. He’s tricky and awkward but Kell’s from a gym full of that style of fighter and it wasn’t hard for me to catch Frankie clean. 4. 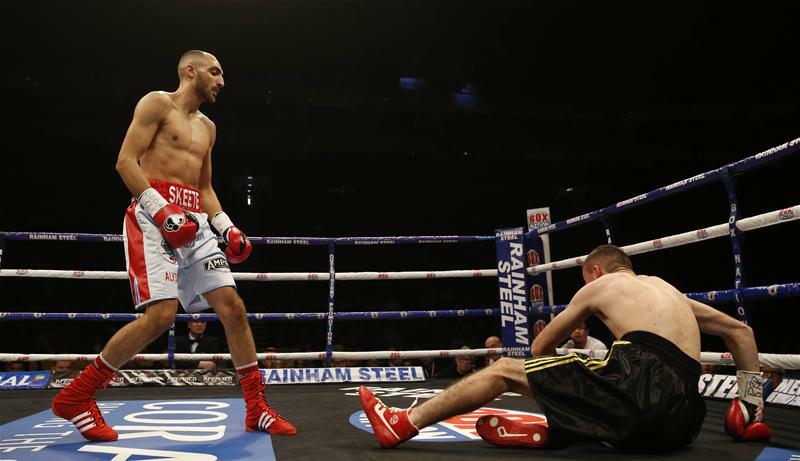 Bradley Skeete (WBO European champion): “If and when Frankie vacates his British belt, I should be in one corner for the vacant title. I showed my level by running him so close and now he’s fighting at world level. 5. Sam Eggington (Commonwealth title challenger): “Lots of people have been bigging Sam up since he did quite well in Prizefighter. He’s big for the weight – big shoulders – and good stoppages over Denton Vassell and Shayne Singleton suggest that he can whack a bit. 6. Junior Witter (ex WBC light-welter champion): “Junior remains the gatekeeper to the division. He’s a typical Ingle gym fighter. In his prime, he was a very tricky switcher who was hard to land flush on and who could knock you out with either hand. 7. Glenn Foot (unbeaten ex Prizefighter champion): “Glenn was an ABA finalist (2010) and is still unbeaten in about 14. He also won Prizefighter a few years ago and he’s had good wins over the likes of Chad Gaynor, Steve Pearce and Jason Cook. “He was out for a while after almost losing his arm in a career-threatening machete attack and has done well to come back with a couple of wins but I don’t think he’s top, top level. 8. Denton Vassell (ex Commonwealth champion): “Denton seems a decent guy and, no disrespect intended but he should retire now. He took a year out after Frankie Gavin smashed his jaw, then got stopped by Sam Eggington and badly beat up by the Ukrainian (Viktor Plotnykov). That wasn’t nice to see.